Pep Guardiola has hinted that Manchester City will dip into the market for a new centre-back in January, on the back of news that John Stones could miss up to six weeks of action with a hamstring injury. The City boss suggested that even had Stones stayed fit, there might be plans to recruit a new defender in January with City still in four competitions and likely to need as much squad depth as possible as the season progresses. “We’re going to discuss (a new signing) when January is coming,” Guardiola said following City’s 2-0 win over Leicester on Saturday. And now a rumoured transfer target of the last two windows, Southampton’s Virgil van Dijk, has been linked again with the Mirror reporting that Guardiola could look to rival Liverpool for the 26-year-old in January. 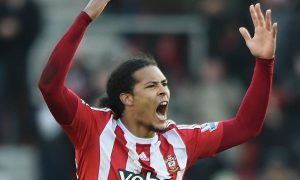 Van Dijk is said to favour a move to Anfield, where he almost moved in the summer, but after a row between Liverpool and Southampton, the Saints may prefer to do business with Man City. City remain unbeaten and are on a 16-match unbeaten run, but the centre-back position has been heavily reliant on the Nicolas Otamendi and John Stones partnership this season. There were encouraging signs, however, against Leicester when Vincent Kompany and Eliaquim Mangala managed to keep out Leicester stars Jamie Vardy and Riyad Mahrez. Otamendi is eligible for selection again following his one-match domestic ban, served at the weekend, but Stones could miss as many as twelve games before returning in the New Year.